NEW Food and Drug Administration data is bad news for ahi poke lovers because bigeye tuna (one of the species sold as ahi) is full of mercury. Mercury is a potent neurotoxin that mothers, women who intend to become pregnant and keiki should avoid. The good news is that Hawaii can protect the public by requiring advisories wherever seafood is sold. The FDA warns women and children not to eat swordfish, shark, tilefish and king mackerel. Women and children are warned to limit tuna consumption, too. New FDA data shows that bigeye tuna have mercury levels nearly as high as king mackerel. Hawaii's women are at high risk of harming the development of their babies. Last year, a study showed that 17 percent of Asian and Pacific Islander women have mercury levels over what the EPA considers safe, and nearly one-third exceed a level that expert physicians consider safe. Another study showed that women in coastal areas had twice as much mercury. California law requires supermarkets and restaurants to post mercury-in-seafood warnings. Illinois also introduced a bill to require warnings because of California's successful law. The national trend is growing. Some major grocers, like Safeway, have begun to post signs nationwide because of concerns about protecting customers. Another supermarket, Wild Oats, started posting signs nationwide in 2003. Wild Oats learned that consumers confidently buy more fish when they have the warnings instead of avoiding fish. Hawaii families should have the right to know so they can make healthier choices, too. 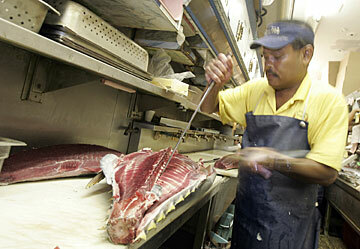 Edmund Lawrence, a 20-year veteran fish cutter at Tamashiro Market in Kalihi, fillets a freshly caught ahi. Warning signs are a commonsense solution to protect island residents and visitors. Whenever Portuguese men-of-war invade our beaches, public health warning signs go up immediately. Why can't we do the same when we know mercury is a health risk in our stores? Nobody wants to poison their children with mercury from fish any more than they want their kids to get stung by a man-of-war. Warnings for pregnant women are required for cigarettes and alcohol because direct warnings are a cheap, easy and effective health education tool. If Hawaii wants to keep its reputation as the "Health State," then the Legislature should act to protect our families from mercury in ahi, shutome and other high-mercury seafood. The state is doing a lot toward that goal, but now it is time for legislators to require supermarkets and restaurants to do their part. Let's be akamai and protect our precious keiki by providing mercury-in-seafood warnings. In the meantime, Hawaii seafood lovers should go to GotMercury.Org, where you will find a simple online mercury-in-fish calculator that shows you how you and your family can safely enjoy seafood. Eli Saddler is a public health analyst for GotMercury.Org, a consumer public health education resource. He is a former longtime Hawaii resident and a graduate of the University of Hawaii-Manoa School of Public Health.